Partial support for the Wii motion plus. 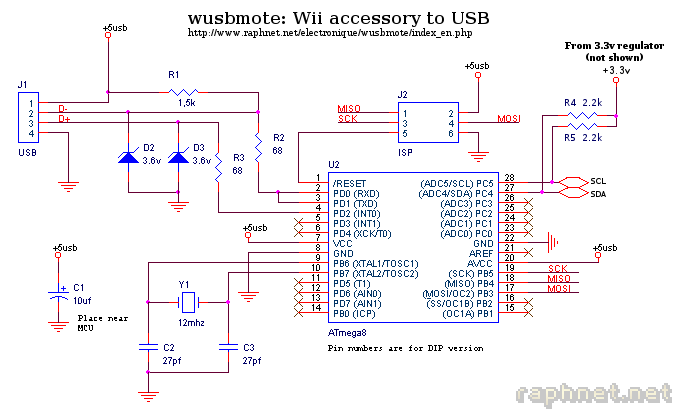 Connecting a peripheral to the Wii motion plus is NOT supported. Yaw, Roll and Pitch speeds scaled down to fit in the 10 bit USB report which severely limits precision. Supports the Nunchuk, official version and clones. Joystick: Pointer. Scrolling is possible by pressing C while moving the joystick. Supports the Wii classic controller (Tested RVL-005 and RVL-005(-02). Left stick: Pointer. Right stick: Scroll. Configurable: Divisor (controls speed), dead zone, scrolling threshold, invert scroll direction. There are no doubts regarding the usefulness of the Classic controller since it is basically a Playstation controller. But what about the much simple Nunchuk controller? With only two buttons and one joystick, I was not sure it would be very useful. But during testing, I quickly realized I was wrong. This controller is perfect for simple games as found for the Sega Master System and of course, NES. Playing with a single hand is possible. The other hand is therefore freed and usable to drink wine or use a smartphone while keeping a distracted eye on the game (especially during "grinding" in RPG games). Playing with either hand is also surprisingly easy. Only two buttons is not much. Luckily for NES games, the missing buttons, start and select, are not used too often. Using the keyboard to control these is not too inconvenient though. The accelerometers are not very useful at the moment. Please send me your pictures if you build this project! I would be happy to add them here. An Atmel Atmega8 (or Atmega8a), clocked with a 12mhz crystal is used. Important: I am not specifying a color code for the cables since it changes depending on the manufacturer. 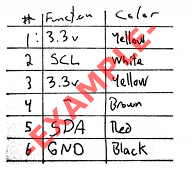 You must find out what color code is used by your cables by using a continuity tester to fill a table such as the example below. Once you have done this, wiring should be easy. Very important: Do not blindly follow the colors in the above example. Sorry to insist, but blindly following a color code may result in a non-functional project, or worst, into permanent damages to your equipment (Controllers, PC, House?). Whatever happens, I will not be held responsible. What about the cable shield? Simply connect it to GND. 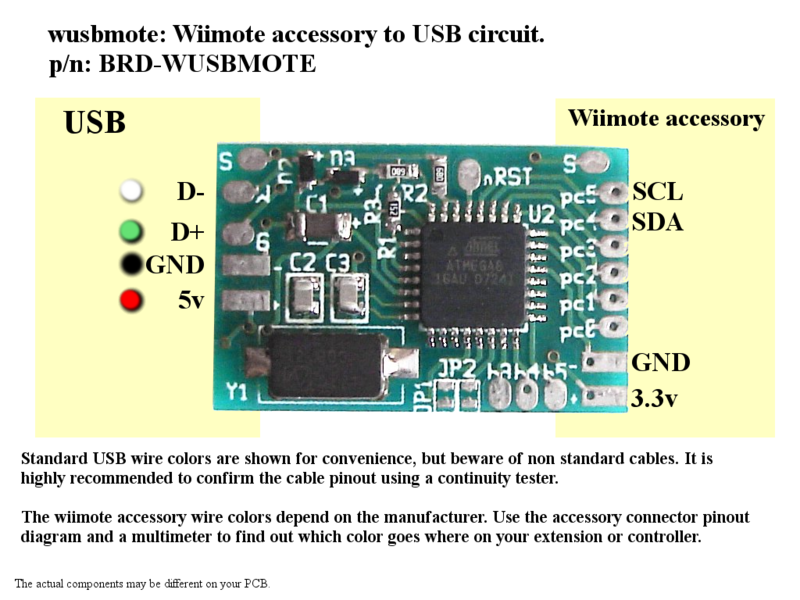 The wiimote wires on the second picture are intentionally desaturated since it is dangerous to follow them blindly, as stated in the schematic section. Created a separate interface (HID-Generic) for configuration. This makes it possible to send commands under Windows, even in mouse mode. Updated configuration tool for above change. Implemented an I2C interface mode (useful for raw controller access, and experimentation. See the i2c_tool/ subdir for an example. Add a makefile to compile the configuration tool under windows. Mouse parameters: Divisor, deadzone, invert wheel. Atmega8: The *-m8-*.hex or *.hex files prior to version 1.4 are for programming an Atmega8. The fuse bytes for Atmega8 are: high byte = 0xc9, low byte = 0x9f. For informations about how to program an AVR MCU, visit my AVR programming page. I used an Atmega8 which does not support USB natively so I used the V-USB software only USB driver for AVRs. In order to prevent driver problems and conflicts, please do not re-use my VID/PID pair for derived or other projects. Instead, please obtain your own. A command-line tool for configuring the adapter is supplied with the source code under the tool/ directory. At the moment, I only tested it under Linux, but as hidapi also supports Windows and Mac OS X, it should be possible to use the tool under those OSes as well. The parameters configured with the tool are saved in the adapter and will be restored the next time the adapter is used. This tool requires adapter firmware v1.2 or newer to work. Each adapter has an unique serial number which can be used to configure a specific adapter, even if several are connected to the same computer. The --list command will display the serial numbers. If you only have one adapter, you may use the --force option which will configure the first (and only) adapter from the list. By default, the adapter is in joystick mode. Mouse mode must be explicitely enabled. 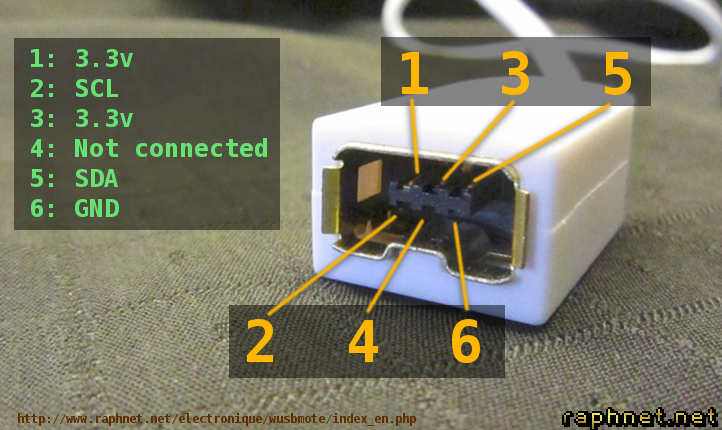 Note that you must use the serial number corresponding to your adapter (not 1001 as in the example below. See listing adapters above). Note: When switching between mouse and joystick mode, the adapter must be disconnected and reconnected for the setting to become effective. If the mouse pointer moves too quickly (or too slowly), speed can be adjusted using the --mouse_divisor option. Higher values result in a slower moving pointer. If the pointer is moving even though the joystick is centered, try increasing the dead zone using --mouse_deadzone. Ideally, this value should be kept as low as possible for better control. Note that the dead zone is applied after the scale is adjusted (--mouse_divisor). The higher the divisor, the smaller the required deadzone (if needed at all) becomes.